now been transferred onto the stage at Leicester’s The Curve. 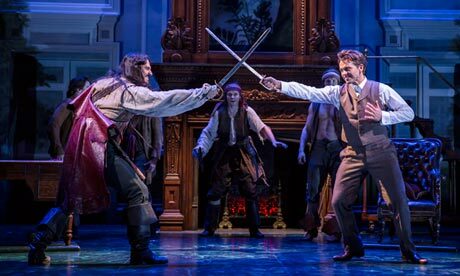 Julian Ovenden plays J. M. Barrie with a pure honesty and manages to catch the childlike attitude of the character without destroying his credibility. Rosalie Craig is Sylvia Llewelyn-Davies, a widow and mother of four boys who catches Barrie’s attention one day in a park. She gives her character such a warmth that it’s impossible not to love her. For me Rosalie is one of the most talented actresses in the UK these days who more than deserves all the praise she is getting. Clare Foster plays Mary Barrie, the unhappy wife of J. M. Barrie. It’s fantastic to see how far Clare has come over the years and how much she has developed as an actress. She is perfectly cast in this show and gives Mary an almost aristocratic elegance without making her appear cold and unlikable. Although not a lead part I have to mention Oliver Boot next who portrays Maximillian Blunt and Hook. Especially in the latter part he had me laughing out loud more than once with his spot on comic timing. Stuart Neal as Elliot (the stage manager) is another highlight who has to be named. This is the fourth show I have seen him in and he once again manages to steal every scene he appears in. Liz Robertson gives a solid performance as Sylvia’s mother who just wants what she thinks is the best for her daughter but loses sight of what makes Sylvia truly happy until it’s almost too late. The rest of the cast does a marvellous job. The four boys I got to see were remarkably talented especially considering their age. The ensemble is spot on – a special mention for Norman Bowman and Ashley Hale who are once again a joy to watch on stage. And let’s not forget the dog – he may be huge but he’s also the cutest thing I’ve seen on stage in a long time. The staging of the show is stunning, simple as that. This is a production of West End standard – actually the whole set, props, lighting etc. are better than what you get to see in some West End shows these days. 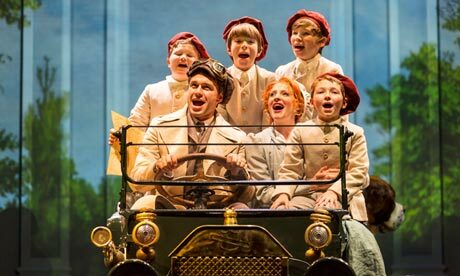 There’s a pirate ship, a proper car, some brilliant lighting effects – Finding Neverland just has it all. So, is there anything I didn’t like? To be honest I’m not totally sure this show needs to be a musical. The songs were all lovely to listen to but they weren’t memorable for me. Personally I could see this do better as a proper play with a little more insight into the different characters. We didn’t really learn a lot about Sylvia’s illness for example so for someone who hasn’t seen the movie it might have been a bit difficult to understand what was happening. It’s obvious the show has been changed a lot since the first preview and is basically still a work in progress. And although it’s not perfect, it has the potential to be huge. Finding Neverland takes the audience on a journey to discover their inner child and in the end it all comes down to one important question: Do you believe in fairies? 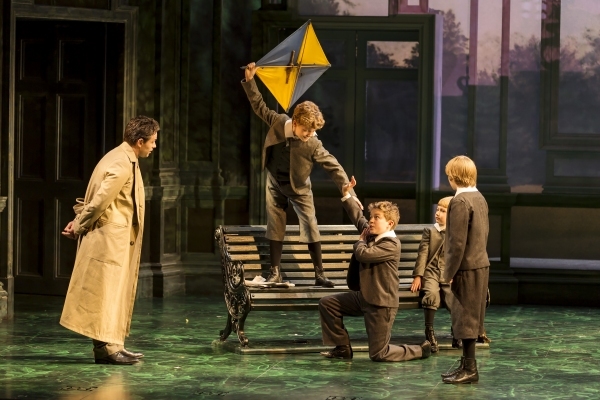 Finding Neverland is showing at The Curve in Leicester until 18th October. For more info and to book tickets go to http://www.curveonline.co.uk .